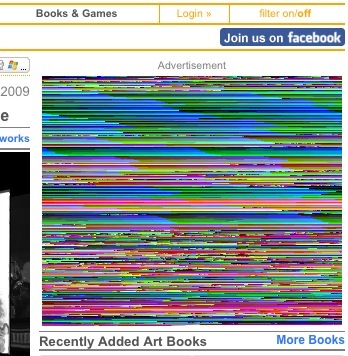 Add-Art is the Firefox addon that replaces ads on the internet with rotating curated art images. Developed by myself and several others surrounding Eyebeam over the past 2 years, it’s free, will speed up your browsing, and features contemporary art that changes every 2 weeks.Â We just released a new version, so install it now! The current show (an excerpt is in the image above) is curated by Steve Dietz and features the work of Vuk Cosic, Graham Harwood, Lisa Jevbratt, Jodi, Jennifer and Kevin McCoy, Melinda Rackham, Vivian Selbo, and Paul Sermon. This entry was posted in Add-Art, Agency Projects, News and tagged add-art, art, online. Bookmark the permalink. Post a comment or leave a trackback: Trackback URL. i love add-art. but can the pics you use be a little more pleasing to look at? most of them are ugly as hell. but i do love it so. thanks! Q: I don’t like the art! A: The art changes every 2 weeks on a Thursday. Maybe it might grow on you. If you really don’t like it, you can disable Add-Art until the next show goes online. Add-Art’s goal is not to replace ads with decoration or wallpaper that everyone finds comfortable or pleasing. You might like the idea of seeing art, but not like all the art you see. That’s ok. That’s how art is. Thank you for the effort and time. The “Install it now!” button is a little hard to see. Not immediately, but the code is available and you are free to write a port – or hire someone to.